Last weekend it was definitely summer my sandals were on, salad was on the menu and I even ordered a new paddling pool! 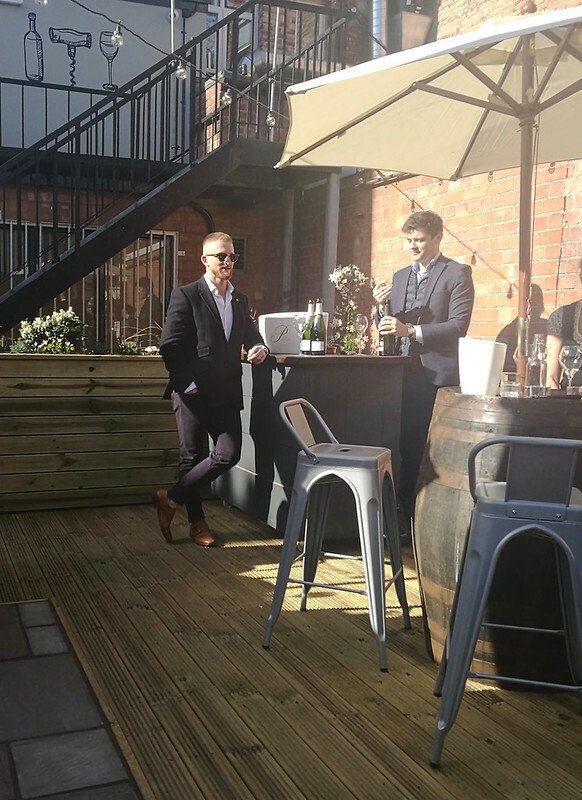 So when an email popped into my Inbox asking if I fancied trying the new Champagne and Prosecco Terrace opening at Another Wine Bar , it seemed like a no-brainer. I pictured myself in a floaty maxi dress, sunglasses on and sipping Champagne. Well obviously the Great British Weather Gods had other plans; April showers turned into April downpours with rain lashing at the windows. However the owners of Another? 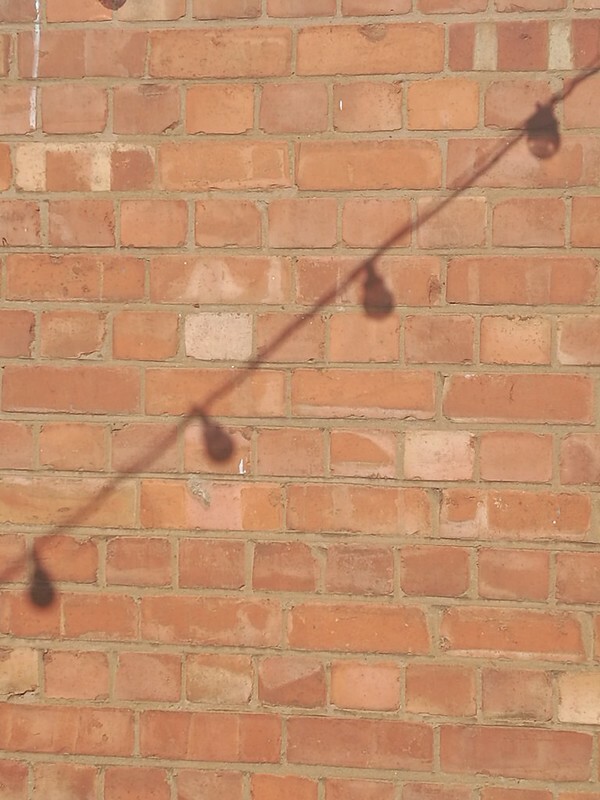 have obviously been praying to the right weather gods and on Thursday evening the sun was shining on their lovely new terrace. Owner of Another? Sam is passionate about providing some new experiences for Nottingham wine lovers, Another? already features self-service machines allowing you to sample wine by the glass. The terrace will bring Champagne from Palmer and Co – the best champagne you have never heard of. 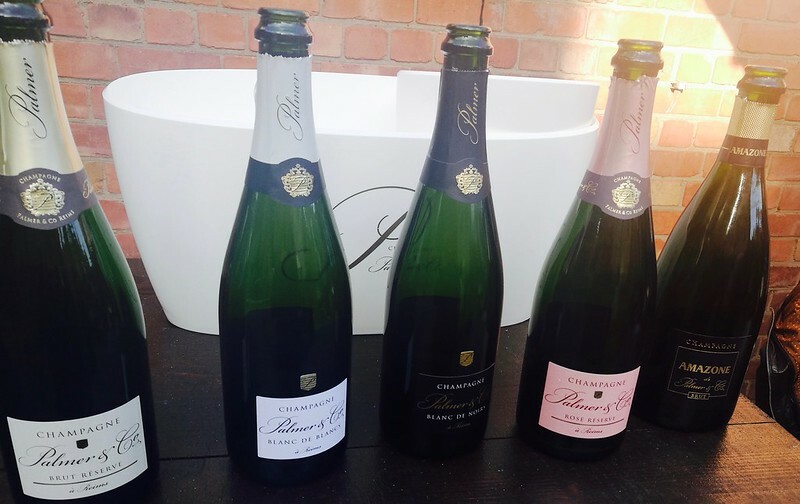 Palmer and Co has traditionally only sold direct to trade, so it is less well known than some other Champagne houses, but it has been very well reviewed. It was certainly delicious in all it’s forms Blanc de Blanc, Blanc de Noirs, Rose Reserve , to the very special Amazone ( matured for up to 12 years). 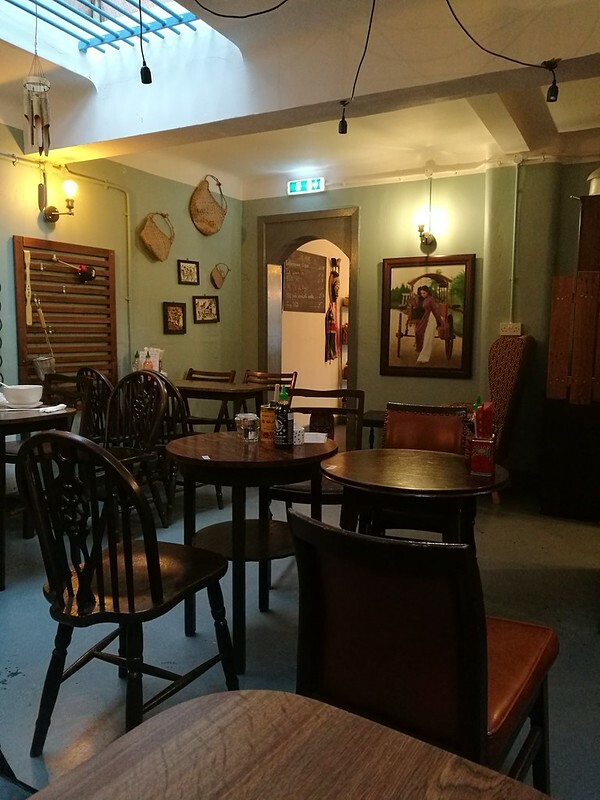 It’s sure to be a hit as the summer hots up and even if the air turns cold you can head to the cosy inside for a glass of red wine and maybe a plate of British Cheese & Charcuterie. We are not going to be growing much veg this year. Our kitchen extension is taking over my sunniest border so I have had to temporarily transplant a lot of perrenials into our raised vegetable beds However one truly indestructible plant in our garden providing a massive crop every year is the rhubarb it’s been dug over and smashed to bits and year on year it comes back prehistorically huge. Crumble is one of those dishes kids can really make their little hands are perfect for scrumbing the topping – much better than trying to get them to fill cake cases with dribbly cake mix. 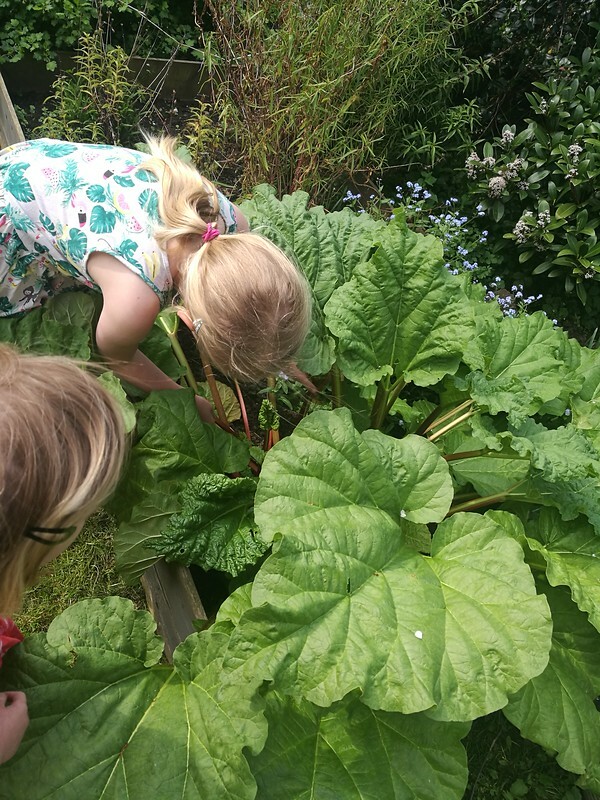 Rhubarb is also very easy for the kids to pick – though check they don’t eat the leaves which are poisonous. Not only is this a lovely pudding – leftovers make a great breakfast served cold with greek yogurt. 3. Blend together your fingers the flour , butter, sugar and oats to make the crumble topping. 4. 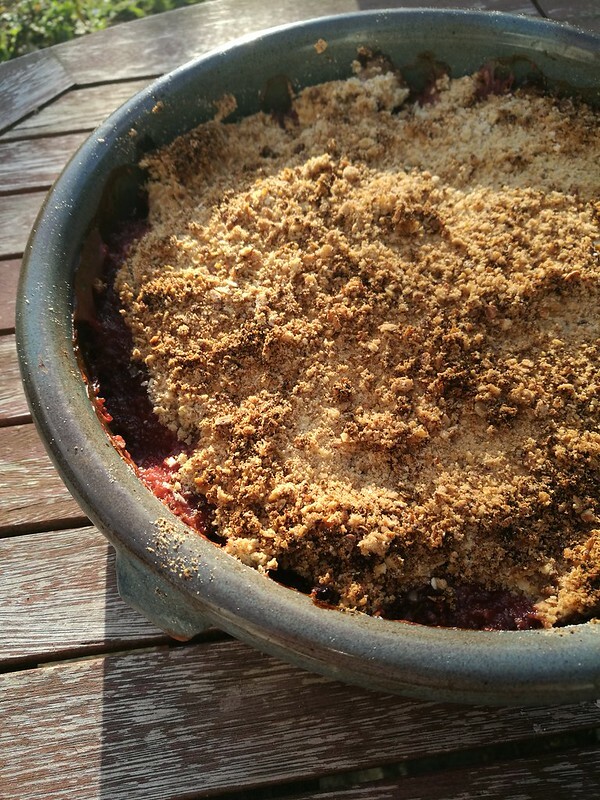 Sprinkle over the rhubarb and bake in the oven for 45 minutes minutes, or until the crumble topping is crisp and golden-brown and the rhubarb filling has softened and is bubbling. We are continuing to try and eat less meat. But sometimes it’s hard to create things that have the wow factor they taste great but don’t always look to impressive. 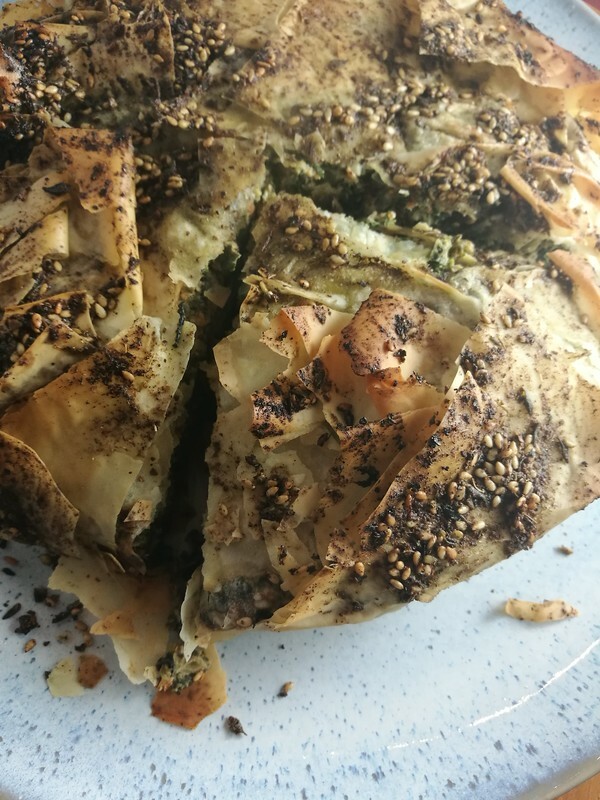 It’s an adaptation of the Spanakopita – a classic greek spinach pie. 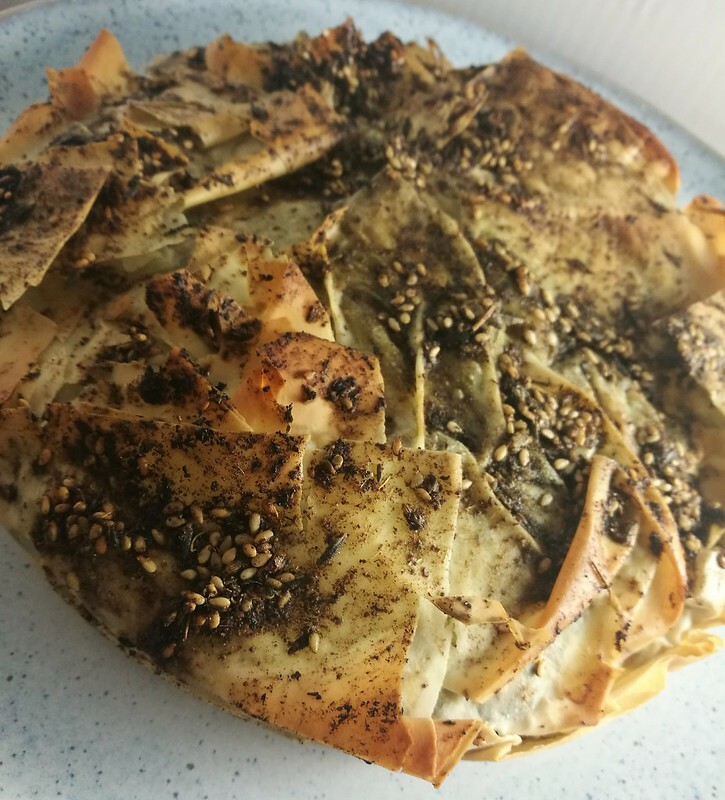 but I’ve added za’atar a middle eastern herb and spice blend to the filling and brushed on top of the filo pastry . This was a blend of thyme, sumac and sesame seeds. 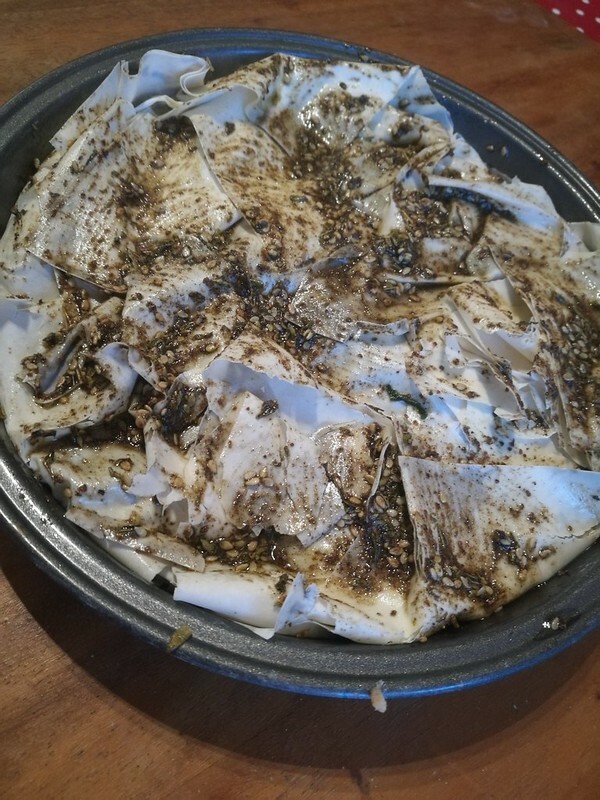 (traditionally Za’atar is a specific type of middle eastern herbs rather than thyme). This dish is fantastic especially as it it made mostly with store cupboard/freezer ingredients. I made it with frozen spinach which is a winter staple in our hours. The pie can be eaten hot or cold, so great for lunch the next day and I think sure to become a summer staple. Defrost the spinach and squeeze out all the water. Roughly chop. 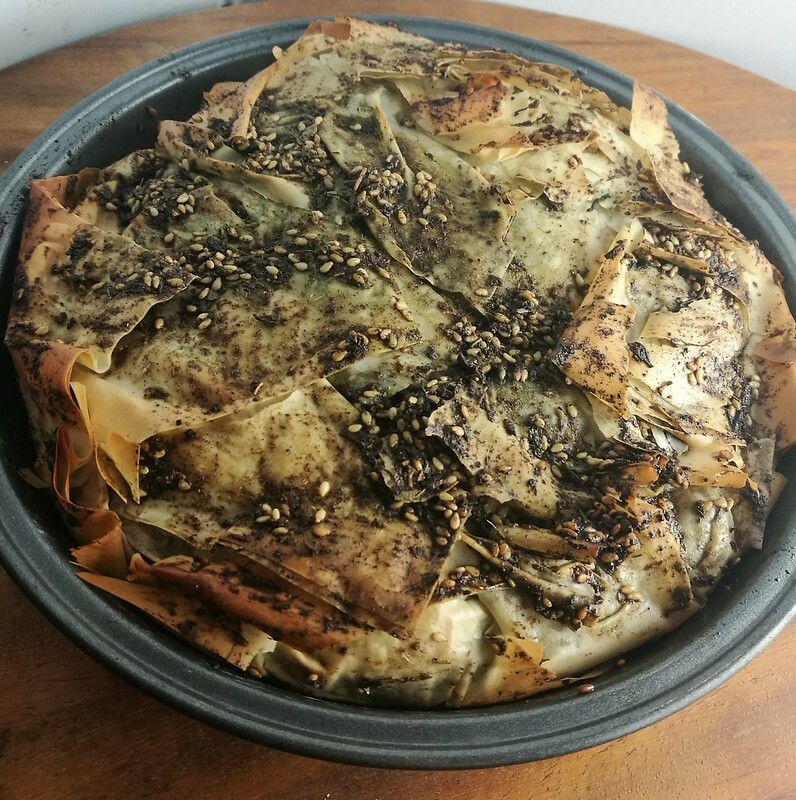 Once softened add the za’atar and stir in. Finally add the spinach and stir well. You can either serve in the pan or lift out , this is easier if you have a spring-form cake tin ( which I don’t) and had to be creative with a fish slice and spatula. This dish was largely inspired by the demolition of my lovely herb garden, which is making way for my new kitchen extension. The sage plant has got a bit woody and won’t be happy being transplanted so I am trying to use it up. 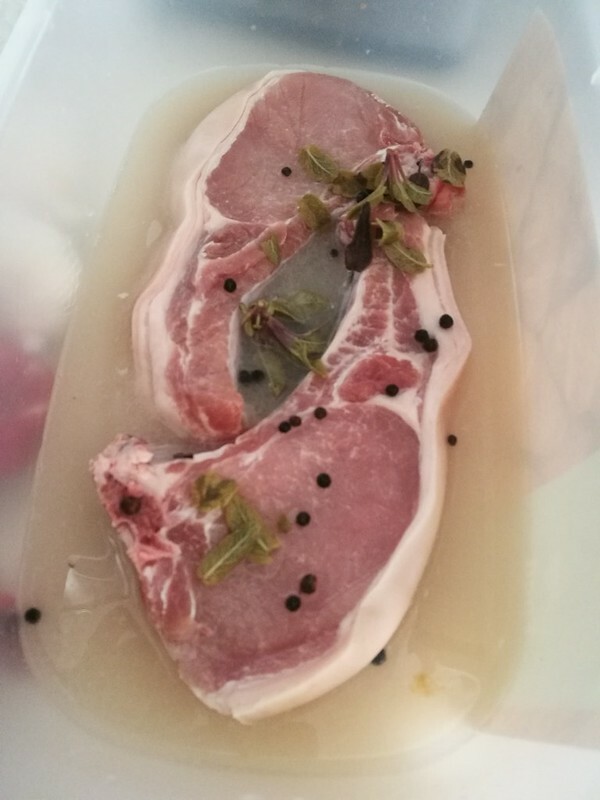 It is definitely worth brining the chops, the whole dish if very hands off just whacked under the grill. Place the chops in one roasting pan and the gnocchi in another. 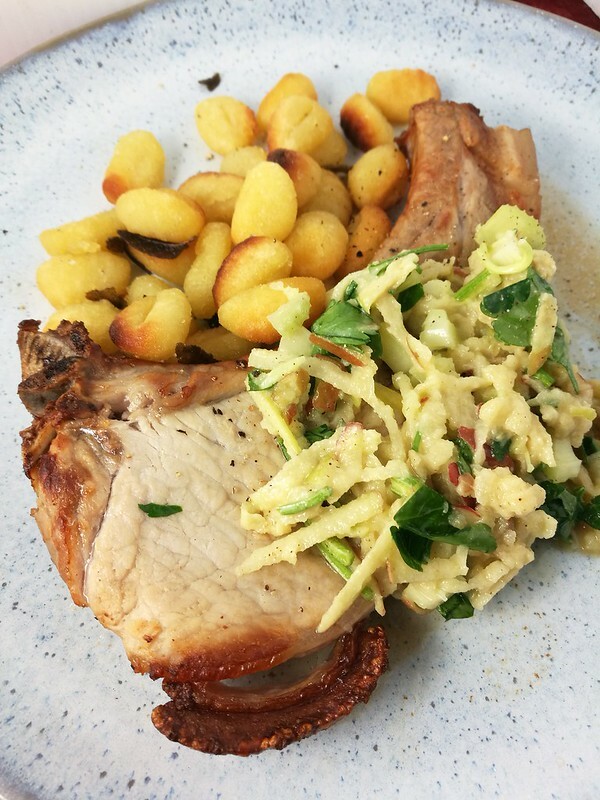 Grill together at 250degC for 30 minutes, shaking the gnocchi three times and turning the pork chops half way through. I like a bit of contrast so I added a salad of 1 grated apple, 1 stick of celery , 1 tsp of dijon muscard & 1tbsp of chopped fresh parsley mixed together. 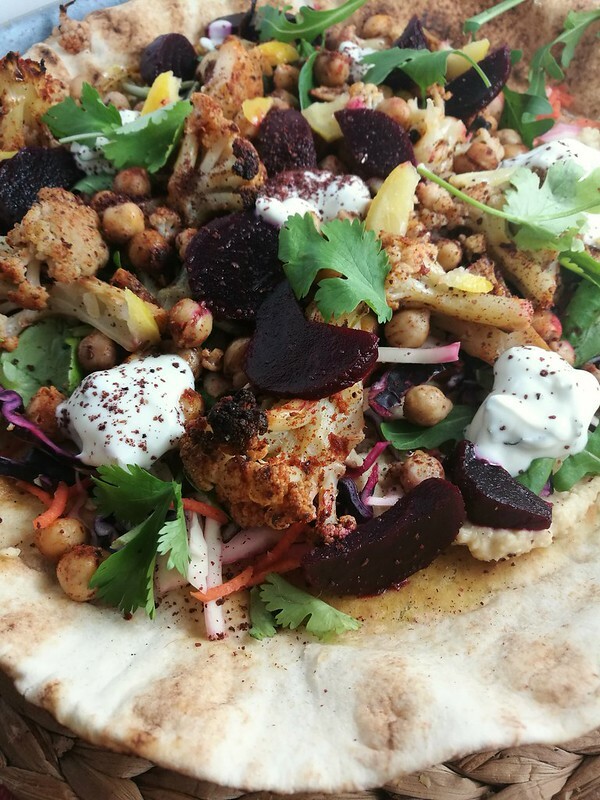 Flatbreads topped with anything make me very very happy. I buy Khobez in bulk from the Murat supermarket they are the size of a large dinner plate. I like to toast them in a pan weighted down (with a Le Cruset lid) for a few minutes until they become really crispy on the bottom. Then a generous smear over with hummus , scatter with cabbage salad , pickled vegetables recipes below . 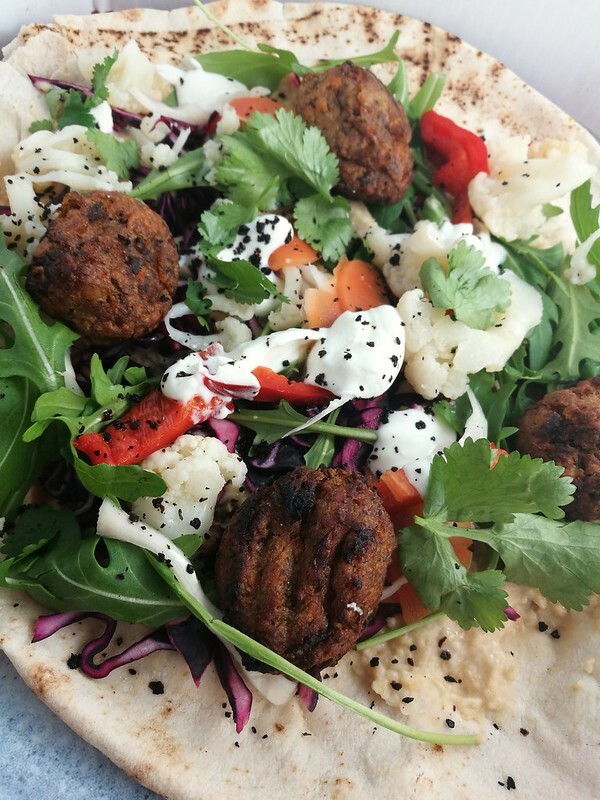 Top with a choice of falafel ( my current favourites are sweet potato falafels from Asda) , roasted vegetables ( cauliflower, auberine, butternet squash) ,or home-made kebabs. (These Adana are finely chopped onion, garlic, coriander and chili mixed with lamb mince , pressued onto flat wooden skewers and grilled – ready in 15 minutes) . Finally scattering over some sumac, fresh salad herbs ( mint, watercress, rocket or coriander) or turksish chilli flakes. We get through two massive heads of cabbage a week in our house – red or white – used as a replacement for rice or noodles. For these salads I will mix with sliced onion , sometimes grated carrot and dress with a little lemon juice or white wine vinegar. Put all the ingredients in the food processer and blend well. 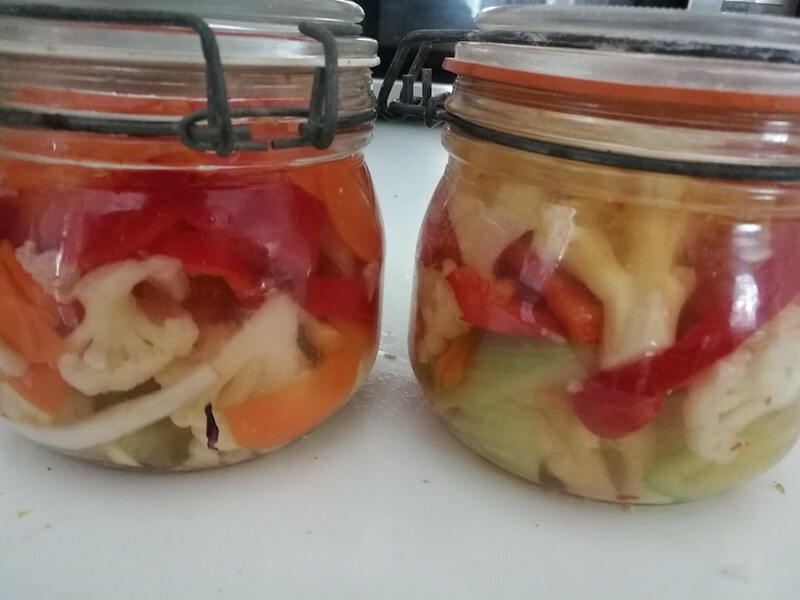 Pickled vegetables (ready in 24 hrs) While in summer roasted peppers or tomatoes are great in winter pickled vegetables give brightness and taste. I used an assortment of cauliflower , celery , carrots and red peppers. In a small saucepan combine water, rice wine vinegar, sugar, spices and salt. Heat over medium heat for about 3-5 minutes, stirring occasionally until the sugar and salt dissolve. Remove from heat. Peel the vegetables and slice. Pour the liquid over the vegetables in each jar. Cover and secure the lid, and refrigerate for 24 hours (or for a few days) then enjoy! This is a great use of leftover Sunday lunch vegetables. We always end up with an interesting mix of depending on what vegetable the kids have decided they don’t like this week. The key additional ingredients are freezer staples – peas and spinach. It used to be that I would throw in some diced chicken thighs but now really loving some tofu or some paneer. 1. Fry the spices and seeds in sunflower oil. 3. Add the tomatoes, spinach and vegetables and simmer for 30 minutes. Social Media is often blamed for isolating people. But in my local community it can often be a great way of bringing people together. Our local Facebook page is used to sell and give away items, recommend tradespeople, it’s helped people borrow emergency heaters when their boilers pack-up, helped find temporary dog-walkers, baby-sitters share surplus veg and eggs. It also means people launching their own business can market them and get a chance to share their skills. The other night – Tali of Falafel Baffle and More posted she was going to be delivering home-made falafel and pitta bread in the area. Now I am a huge falafel fan, I’ve pretty much decided it would be my last meal. I am seriously considering buying a deep fat fryer just to be able to make my own as we eat them once a week. I placed an order for sweet potato falafel and a bag of pitta bread. The falafel and bread arrived at my door, frozen easy to re-heat in the microwave (or as I like my falafel crunchy – under the gril) perfect for the next night , you can also order cabbage salad , vegetable pickles and hummus. 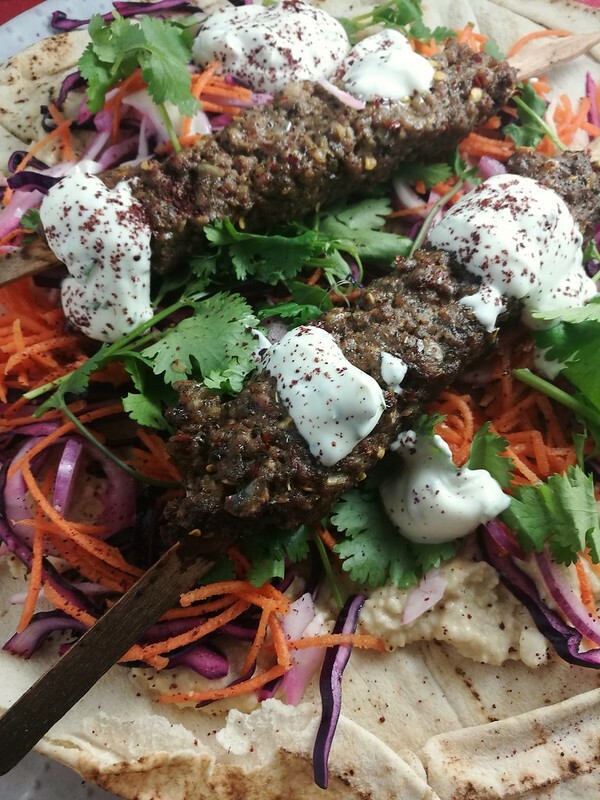 The falafel were delicious and the pitta bread actually puffed up and could be used as pockets something no store bought falafel has ever managed. 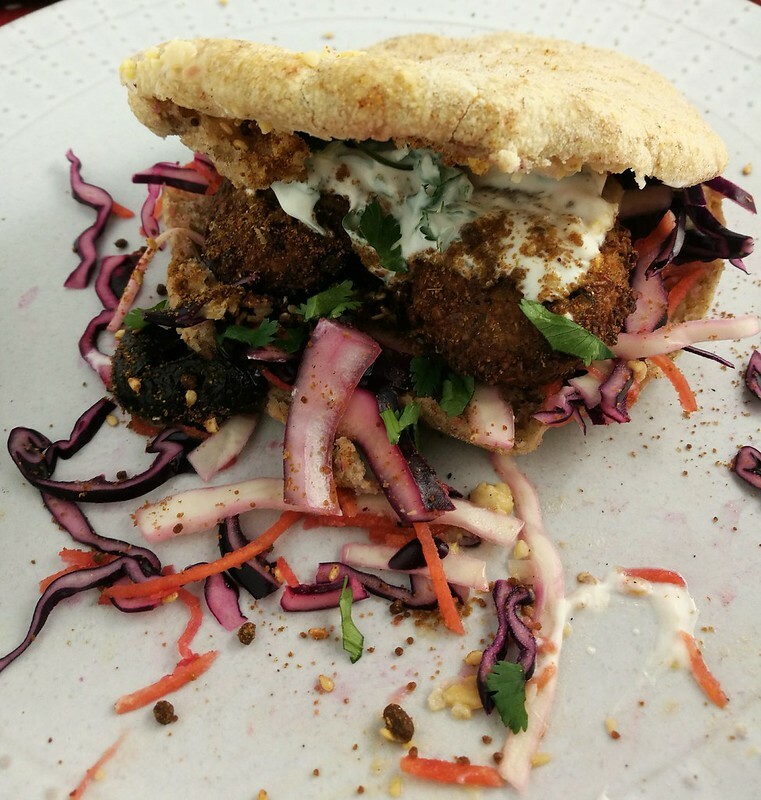 Untypically my 6 year old decided to wake up and she loved them too , so that’s another falafel convert, bit annoying though as I will have to share. 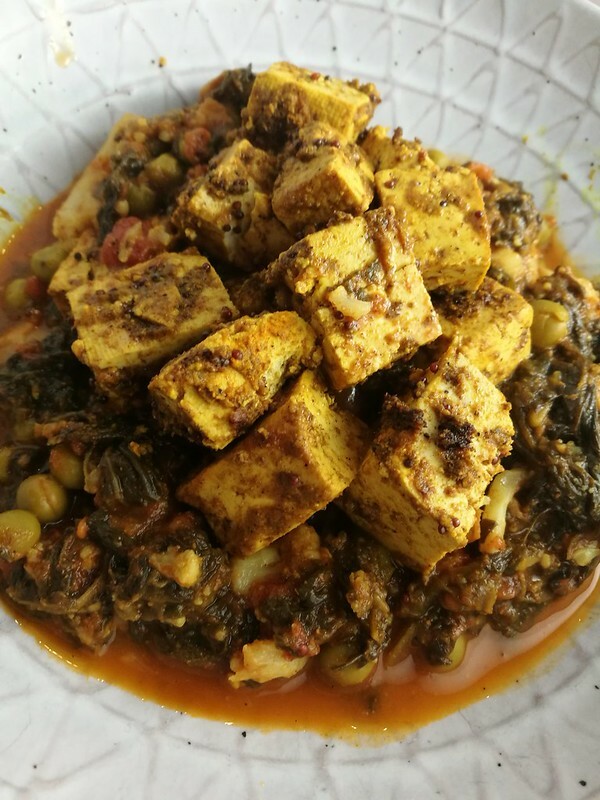 Nothing better on a cold wintry day that a massive bowl of stew and this Korean tofu dish definitely hits all the spots. 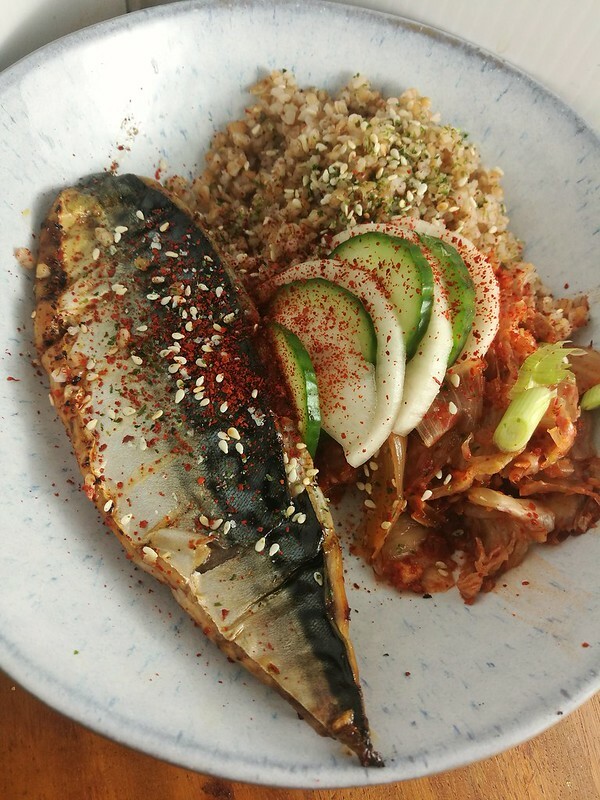 This was made with home-made kimchi – I’ve been making my own kimchi for a few months now after a cookery course at the lovely Inkyung’s Kitchen . Beware it is fairly addictive and we are very fortunate to have a cellar to store it in as the smell seems to seep out of the most airtight container. This stew is usually made with some pork belly in it but I think it worked pretty well without. 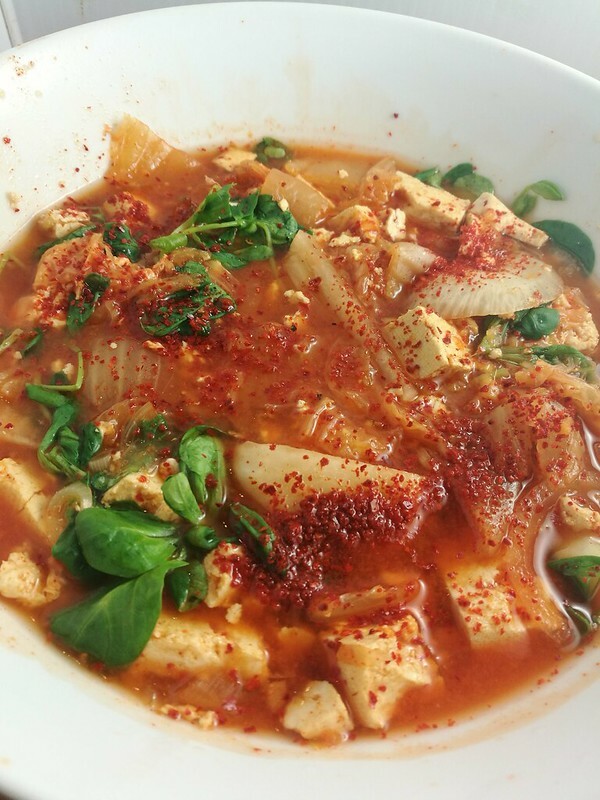 Bring the stock to a simmer with turnip, onions, garlic , red pepper and chili paste. Slice the cabbage and remove the cores. Chop roughly into two inch long pieces , you don’t want it too small. Blend together the chilli , pepper flakes , ginger and garlic. Roughly chop the spring onions. Put the cabbage into a clean sterilised glass jar , and place a disc of greaseproof paper on top push down firmly. It can be used immediately but it is better to wait a week or so. I’ll be honest a month ago when Nick said he was going to be pescatarian for a while I did think – this won’t last long. This is a man who would literally count the pieces of chorizo on his plate and ask if I thought I had more. I heartily agree. After years of open-plan office work, I mostly work from home now and it’s heaven. There are no office politics, no requests to show people how the photocopier works/ re-format their word document . No just asking my opinion when I am right in the middle of something. But as the social isolation can get a bit much I do like to have the odd morning working in a coffee shop. I always thought it would be distracting but actually in the noise and hub-bub of a cafe I can manage to tune everything out largely as it doesn’t have any relevance or interest me. 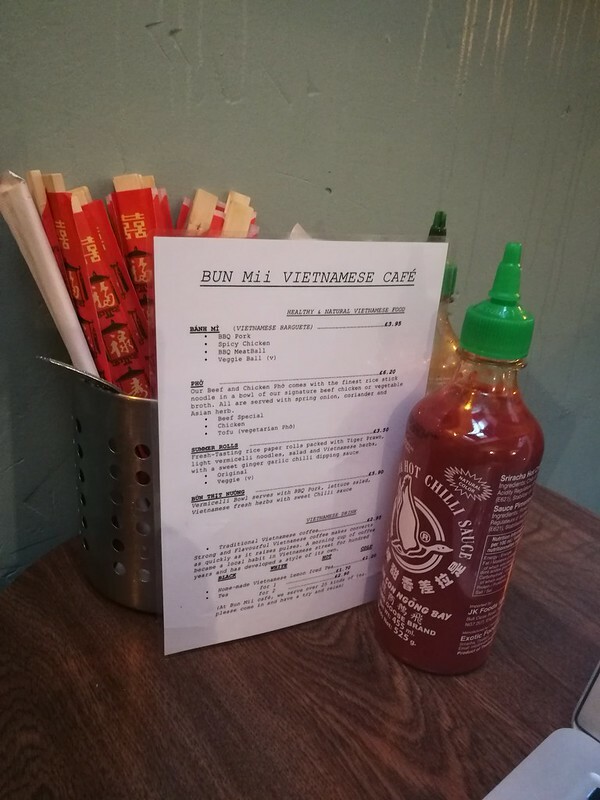 Today I worked and had lunch in the lovely Bun Mii Café it looks small from the outside but inside there is large back room with plenty of open tables. If you need something to fuel a working frenzy Vietnamese Coffee is just the ticket, made with coffee and condensed milk, it’s like rocket fuel. For a more mellow approach they also have 31 different types of tea. 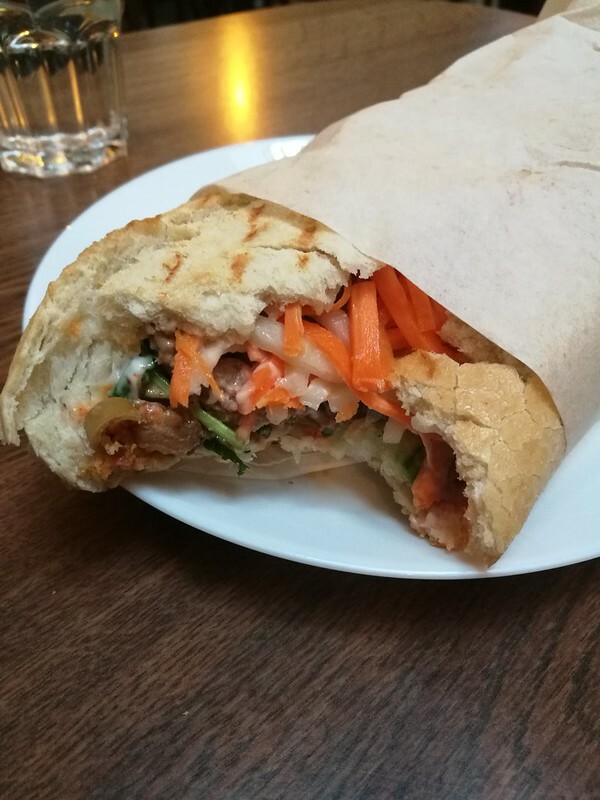 It’s a simple menu , Pho (Vietnamese Soup) , Noodle Bowls and summer rolls another of my favourites, but the main attraction for me are the Banh Mi, a, crispy baguette with served with a filling of pork/chicken/vegatables , pickled vegetables , crispy vegetables and a spicy dressing. This is no soggy or chewy baguette, oval shaped and locally baked. It’’s light and crispy bread, packed with flavour, for less than the price of a soggy Subway sandwich.